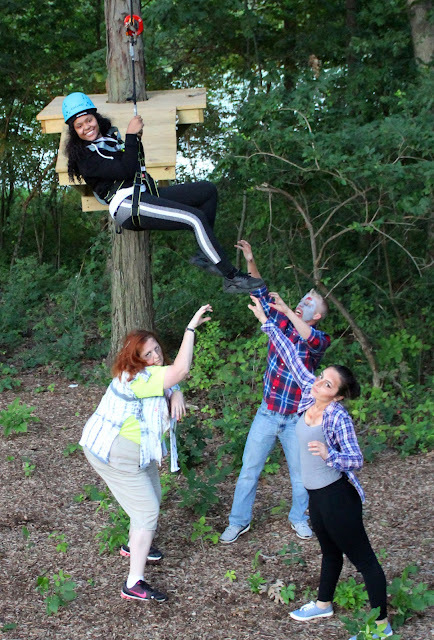 Zombie Zip Lines will provide new thrills throughout the month of October at Edge Adventures Aerial Park – Deep River NWI when the park will be transformed into a Halloween experience unlike any other in the Chicago/Northwest Indiana region. Zombies take up residence on Fridays beginning October 5 from 6 to 9 p.m. with the last Zip Line Adventure beginning at 8 p.m. Talented actors from area high schools will be starring as the zombies. 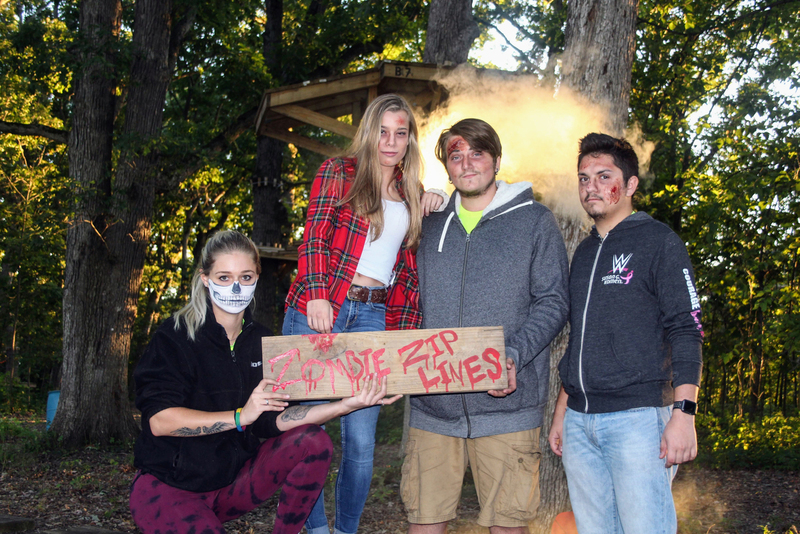 The first Zombie Zip Line Friday (October 5) will feature actors from Hobart High School's Theatre Department. Lake Central High School Drama Club will haunt the grounds on October 12. And the final two Fridays - October 19 and 26 - will star Highland High School's Theatre Department. Against a backdrop of fall leaves bathed in Halloween lights and spooky sounds, beginning adventurers and weekend warriors can zip line their way through more than 50 treetop obstacles while zombies roam the scary forest below and ghosts hang out in adjacent trees. All of the aerial park’s challenges provide thrills and screams for guests at every skill level. It’s a new way to celebrate Halloween all month long. Adults and kids can harness up and climb into the trees to embark on adventures that include traversing across rope bridges, balancing on log beams or climbing on cargo nets. There will be a far less scary experience at the kids’ course which includes low to the ground elements, zip lines and little pumpkin adventures for children ages 4-7. Tickets are $10 for a one-hour experience. Edge Adventures provides all safety equipment – helmet, harnesses, belays and gloves. Guests participate in a safety briefing and practice course, and are assisted by Edge ACCT-trained staff throughout each of the course routes. They have the thrill of climbing, zipping and working through the courses with the security of knowing that they are 100 percent on the safety line from start to finish. 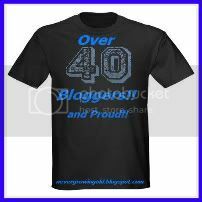 Certain age, height and weight limits apply for the larger courses. Adventurers must be at least 8-years old, with a minimum weight of 40 lbs and a maximum of 275 lbs. Hands must reach 66” high with feet flat on the ground. The two-hour adventure is $42 for adults and $32 for children 8-12. The three-hour adventure is $49 adults, $39 children 8-12. Groups of 20+ may reserve a Group Adventure any day subject to availability. Call or email for details. Edge Adventures Aerial Park NWI is located at 9001 E. Lincoln Highway, Crown Point, IN 46307. The park is open on Fridays from 4 p.m. to 8 p.m. (last 2 hour adventure goes out at 8 p.m.). Zip line adventures (minus the zombies) are also available on Saturdays and Sundays from 10 a.m. to 4 p.m. (last 2 hour adventure goes out at 4 p.m.) throughout the month of October.